Tired of those old plastic sunglasses that feel cheap, clunky and heavy? Our designers at Viable Harvest have created the perfect lightweight wooden sunglasses just for you! Our sunglasses are hand crafted with organic red sandalwood for a unique design that looks and feels great. With sleek lines and a leisurely style, the Viable Harvest sunglasses are ideal for the backyard or your next great adventure. We love the red sandalwood not only for its strength but for its amazing look - an exciting and unique grain and color pattern that boasts nothing but style. They've been lightly polished to enhance their natural wooden tones and provide a stunningly smooth finish. We use premium, high quality, certified polarized lenses with a UV400 rating. We're not only concerned with how you look, but how we can help protect you for life. The classic wayfarer style is anything but boring. A universal fit and unisex design make this a great choice for our regular customers or for those trying Viable Harvest for the first time. We make all of our products from natural, eco-friendly wood, and we're confident these will look and feel great next to your skin. Going casual? No problem! Dressing it up for a day out? We've got the look for you! We've also included a custom designed gift box with a soft, microfiber cleaning cloth. QUALITY YOU CAN DEPEND ON. Each and every pair of our sunglasses are unique, hand-selected and packaged in the USA. We care about our customers. Not satisfied? Let us know. We'll do our best to make it right. YOUR EYES ARE IMPORTANT! Premium UV400 polarized sunglasses that reduce the glare reflected off roads, water, snow, and other surfaces. Designed to provide long lasting protection for your eyes. PERFECT GIFT FOR YOURSELF OR THAT SPECIAL SOMEONE. Whether it's a birthday, anniversary, Valentine's Day, Father's Day, Graduation, or Christmas, our sunglasses make a fantastic gift. Another bonus? We've included a great looking gift box and microfiber cleaning cloth. CLASSIC LOOK THAT'S ALWAYS IN STYLE. Classic vintage wood sunglasses look great on everyone (unisex). A throwback style with a modern flair. WE CARE ABOUT YOU! 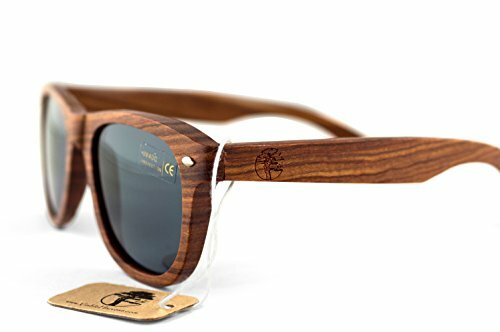 All natural solid wood sunglasses made from organic sandalwood. Lightweight, durable and designed for your comfort. Our sunglasses help you look good and feel great! Great Designer Style! If you have any questions about this product by Viable Harvest, contact us by completing and submitting the form below. If you are looking for a specif part number, please include it with your message.